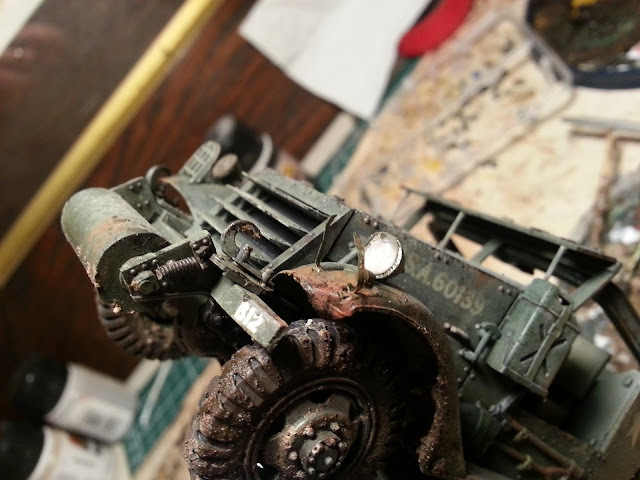 The vehicles are almost done. I've been doing those fiddly little bits and pieces at the end of a build (this was my to-Do List a couple of days ago). Tonight I modelled some damage to the front left fender of the White Scout Car. I normally wouldn't be screwing around with heat near a built model this late in the game, but truth be told I lost the headlight protector grill and so I decided to make a feature of it and damaged the area. That said, I think I ballsed up the fender a bit. I fear it looks like melted plastic rather than dented sheet metal. Hopefully my paint and rust will save it. I pushed it just a bit too far. Should have walked away just that little bit sooner.